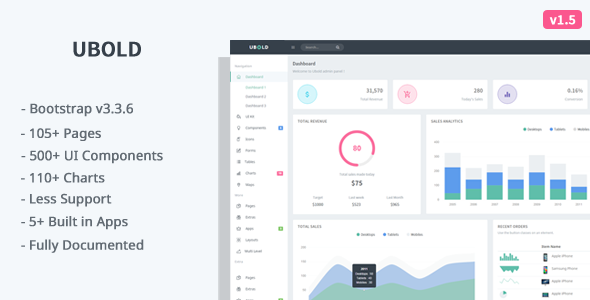 Ubold is a fully featured premium admin template built on top of awesome Bootstrap 3.3.6, modern web technology HTML5, CSS3 and jQuery. It has many ready to use hand crafted components. The theme is fully responsive and easy to customize. The code is super easy to understand and gives power to any developer to turn this theme into real web application. - Added a new color schemes i.e. flat(purple) and dark. - Fixed sidebar for mobile devices, now it will not be displayed by default. Previously this was taking some space on mobile devices. - Added typicons font icons.Tablesaw table and Ricksaw charts. - Updated Bootstrap(v3.3.6),Datatable and Fontawesome (v4.5). - Fixed menu and other items was not clickable on Iphone and ipad. - Fixed menu item should be active when the page is opened. - Fixed for mobile, the sidebar menu should be expandable. - Fixed issue with bootstrap table. - Fixed issue with datatable. Now it's responsive. - Added new color scheme. I called it dark layout. - Added loader. May be I remove it in next version.